Only four minutes into the game Salem was already up 12-0. The second score came on a 5 yard TD run by Gabe Pena. The Blue Devils have good depth in their backfield, with a number of different guys who can carry the rock. "Jason Martinez and Matt Loffredo ran the ball well for us" said Salem first year head coach Rob Pike, who had served as team's assistant coach for the past 3 years. "The o-line did a good job of coming off the line and blocking. Jarred Lozowski did a good job on defense, he read his keys well." Other standouts on defense for Salem were Jeffrey Gore and Patrick Hughes, as well as Ken Calabrese who had an interception. Salem struggled mightily last year but looks to get back on track this season. "We're excited" said Coach Pike. "It was a pretty good night, we have some good kids." Souhegan meanwhile also has a new head coach in Mike Lochman, who comes over from Hollis-Brookline where he was an assistant. He replaces Mike Beliveau, who built the Sabers into one of the state's top programs. Beliveau is now an assistant at Manchester Memorial. Souhegan has a new coach and only 2 returning starters. They graduated some very talented players, including lineman Jake Kennedy (now playing at UNH) and Tyler Ford (now playing at Bentley). This could be a rebuilding year for the Sabers. Salem went up 20-0 with 9:53 let in the 2nd quarter on a 4 yard TD run by Doug Maroun which followed a long run by John Cerretani. In addition to Martinez, Loffredo, Maroun, Cerretani and Pena, junior Michael Iascone was also productive running the ball. At QB for the Blue Devils was Nicholas Shumski. Clearly Salem was he better team early on, but Souhegan got better as the scrimmage went on. "We're not a young team, so we need to stop playing like one. We got off to a slow start as we took awhile adjusting to the Division I speed of the game." After going down 20-0, Souhegan responded with an impressive drive. Less than 2 minutes later, QB Isaac Nevrla hit William Hart for a 37 yard TD pass. From that point Souhegan played even with Salem. Josh Streibel and #52 (no on roster) boh recorded sacks in he 2nd quarter, while Drew Prescott and Cameron Kinney were effective running the ball. Nevrla and Mike Mancini split time a QB for Souhegan. "I thought both Michael and Isaac played equally well" said Coach Lochman. "We want just one guy to be our QB though, it will be a tough decision." From talking to folks around Gill Stadium on Friday night there seemed to be one that that everyone could agree on - Trinity looked REALLY good. They looked good by Division I standards, which is a scary thought since the Pioneers are in D-II. Trinity was in control of this scrimmage from start to finish. Less than 3 minutes into the game senior QB Carmen Giampetruzzi threw a laser to junior TE Ryan Boldwin for a 45 yard TD pass. Giampetruzzi (committed to Boston College for baseball) was outstanding at QB, making great reads and throws and showing solid pocket presence. With Boldwin and senior Tristen Theroux he has 2 big, fast TE's who can get down the field fast, catch the football and are tough to bring down. 'G' also has a slew of RB's to hand it off to, including Brad Rhoades, Zach Poole and Austin Chambers. Poole was tough to bring down, needing 4 guys to tackle him on one run. Rhoades showed good speed getting to the edge. Offensively this team is in mid-season form. "The o-line held up well for us, Carmen didn't get hit all game" said Trinity head coach Steve Burns. We have 4-5 RB's who can run, 2 TE's who are as good as any in the state, and Carmen finds them all. On defense we need to clean things up, hough. We gave up too many yards." One guy who did make some plays on 'D' was sophomore linebacker Nick Perdue, who came from the blind side unblocked rushing from the outside to pick up a sack. Matt Fitzgerald got Merrimack on the board with a 2 yard TD run, while Joe Giampetro also ran the ball well. Jeff Genet made some big hits on defense for the Tomahawks. Trinity looks to be one of the favorites in D-II, along with Plymouth and Portsmouth. All 3 of those teams would definitely be able to compete in D-I. This was a pretty even game, and West had a chance to tie or take the lead late but Memorial LB Tyler Bachert made a BIG interception to seal he win. Memorial was however, playing without one of their starting lineman, their starting lineman and one of their RB's. West jumped out to the early 8-0 lead with 4:14 left in the 1st quarter on a 20 yard TD pass from QB Zach Theriault to Michael Springer-Ingram. Memorial responded with a TD of their own, as QB Mitchell Coy hit WR Harmel Nkongolo from 17 yards out, after Isaac Velez and Nate Hall both made solid gains in the drive to get the Crusaders into the red zone. Deon Ball was a hard hitter on 'D' for Memorial. The Crusaders went up 14-7 soon after that as once again Coy hit Nkongolo for 17 yards and then Coy found Ball from 6 yards out for the score. For West, Jhoneston Goncalves was solid in pass coverage, and #64 (not on roster) played well on the d-line, making tackles and taking away running room up the middle. Theriault connected on passes to Springer-Ingram and #18 (not on roster) to get the Blue Knights into Memorial territory on their final drive before throwing the INT that ended. Concord looked very good, especially as the game went on. They had their best season in years in 2012, just missing out on the playoffs. Now the Crimson have most of their starters back, so they could certainly be a dangerous team this fall. They were led by QB Robbie Law and the running back duo of Leo Sudieh (pictured above) and Walters Ndi. Sudieh and Ndi are both very fast, athletic, explosive backs capable of racking of big yardage. Law is a dual threat as a passer or rusher. Concord lineman #71 (not on roster) played well in the trenches. Goffstown enters the post-Connor Benjamin era, it looks like they now have a team with many different weapons as opposed to just one guy carrying the load. Christian Marquis is one of those guys, and he caught a screen pass and took it 66 yards for a TD to put Goffstown up 6-0 just 2 minutes into the game. Ndi had a 70 yard TD run that was called back due to a penalty. Sudieh, Ndi and Law all made strong runs, ending in a Concord D to put the Crimson up 7-6. Goffstown fumbled while running an option play, and it was recovered by #19 (not on roster). Law was then picked off by Ryan Pinard. That gave the Grizzlies possession on the Concord 10 yard line. Concord's defense stepped up to prevent a touchdown, and Tanner Putnam kicked a 27 yard field goal to put Goffstown up 9-7 with 1:15 left in the 1st quarter. On the ensuing kickoff return Concord went for a double reverse but fumbled on the exchange and it was recovered by Goffstown's #42 (not on roster). Coach Huft's team once again started on the Concord 10 yard line, but they were intercepted by #22 for Concord (not on roster). The pocket collapsed on Law, but he was able to scramble away from the pass rush and run for a solid gain. Sudieh made another impressive run. Then came a great play call by Concord, as Law faked a handoff to Ndi and took off with the ball. 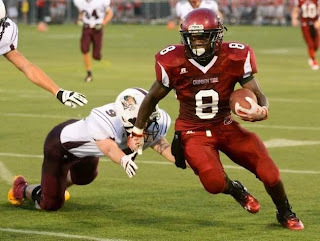 He ran 20 yards for he touchdown, and the Crimson went up 14-9 with 8:43 left in the 2nd quarter. Goffstown was then forced to punt, giving Concord the ball back. Ndi made another good run showing both speed and power. But then the Grizzlies' defense stepped up, as Ben Genest and #22 (not on roster) teamed up for a sack. Concord answered right back though, as Sudieh caught a short pass and ran 42 yards for the score. He showed good speed, patience and followed his blockers. That put the Crimson up 20-9 with 6:18 left in he 2nd quarter. 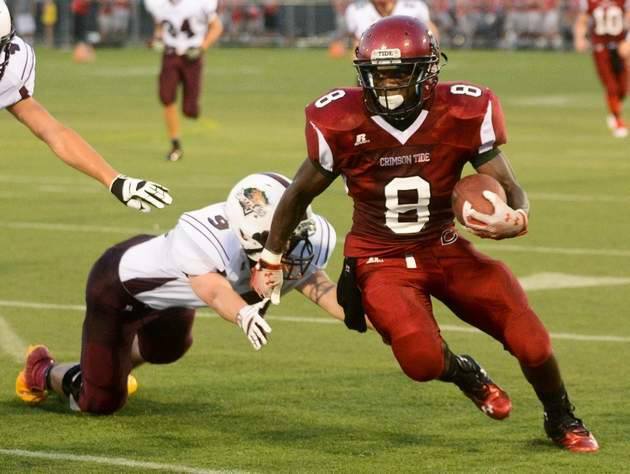 Goffstown was again forced to punt, and Concord added another score as the duo of Sudieh and Ndi continued to dominate. "We're a veteran team, we have lots of experience" said Concord head coach Eric Brown. "We return 9 starters on both sides of the ball. We did the necessary things we had to do in the off-season." This game marked the return to the lineup of BG's CJ Boykin (rumors leading up to this game was that Boykin was not going to be on the team his year) and the first appearance in a Central uniform for Jesiah Wade (star player who transferred from Campbell). Both players made their presence felt early on. Boykin caught a short pass coming across the middle from QB Tommy Hurley and took it 45 yards for the score to put BG up 7-0. Central answered back, as Wade ran in a 4 yard TD. The score was set up by the play making of Julio Rincon and a pair of nice completions from QB Richie Greeley to WR Abe Madra. In addition to Boykin, BG also got strong play out of the backfield from Michael Devereaux. Boykin ran for 34 yards, then had a 40 yard punt return for a TD called back due to a penalty. Later Hurley hit Kyle Cushion with a solid pass, with the drive ending on a 29 yard FG by senior kicker Chris Fox. BG got the ball right back, but Hurley was intercepted by Wade, showing he can make plays on both sides of the ball. Hurley again connected on a pass to Cushion, as Anthony Reale was strong on defense and Patrick Flathers (6'4, 275 lbs.) anchored the line. Central meanwhile got solid play on the line from Dylan Boucher. BG held on for the 10-7 win. Central was playing without RB Hector Velez. Pinkerton is expected to be one of the state's top teams once again. Timberlane meanwhile missed the playoffs last year and were playing without their starting QB Erik Nelson and RB Tyler Furrey (younger brother of former standout RB Derek Furrey). So many people were expecting Pinkerton to run away with this one, but give Timberlane credit because they hung right in there. Timberlane went up 6-0 on an 11 yard TD pass from QB Jason Hughes to WR Zachary Downey. On that play Hughes got good pass protection from his o-line, he made a good throw to the right corner and Downey made a nice grab. Pinkerton tied it up 7-7 on a 43 yard TD run by senior Manny Latimore. Latimore and Nashua South QB Trevor Knight are the preseason favorites for Mr. Football in NH. Pinkerton used 2 different guys at QB, with both Jacob Froelich and Jack Hanaway getting snaps with the first-stringers. "Jake Lisauskus was going to be my option quarterback but he tore his ACL during lacrosse season" said Pinkerton head coach Brian O'Reilly, who also coaches the school's LAX team. "He is a tough loss for us, as he was also going to be our only returning starter in the secondary." Lisauskus has committed to UMass for lacrosse. Hughes again connected with Downey for yet another 11 yard TD pass, this time to the left corner of the end zone to put the Owls up 14-7. From there however it was all Pinkerton, as the Astros rattled off 3 more TDs to win 28-14. Shawn Murray, Matt Madden, Barnes Markevus, Nick Liporto and Justin Poitras all played well defensively for Pinkerton who open the season with a big game Friday night at Bedford. Ryan Day knotted the game at 14-14 with a 54 yard TD run for the Astros, and then Latimore returned a punt 52 yards for a score to make it 21-14. Kyle Faucher got some good yardage after he catch (YAC) but Timberlane was forced to punt. Pinkerton got their final score on a 5 yard TD run by Jason Hansen.